Associated PressU.S. Sen. Marco Rubio of Florida, left, shakes hand with Japanese Prime Minister Shinzo Abe before their talks in Tokyo, Jan. 21. After a few weeks of rough sailing in his diplomatic dealings with Washington, Prime Minister Shinzo Abe received a much-needed reprieve Tuesday from an unlikely American visitor: Sen. Marco Rubio of Florida. During his stop in Tokyo, the Republican senator visited Mr. Abe at his residence and offered assurances on two issues at the heart of Mr. Abe’s policy agenda: the senator’s support for Mr. Abe’s efforts to bolster Japan’s military and a rebuke of China’s aggressive territorial policy. Mr. Rubio, the ranking member of the Senate Foreign Relations Committee’s East Asian and Pacific Affairs subcommittee, was the most senior member of the U.S. government to meet Mr. Abe since the Japanese leader’s visit to a controversial war shrine in late December set off the fury of Japan’s neighbors and upset officials in Washington. “I’m encouraged by and personally support your effort to reinvigorate the security capacity of your country, especially in light of illegitimate territorial claims made by some of your more adventurous neighbors,” Mr. Rubio told the prime minister at the beginning of their meeting. Mr. Rubio’s visit comes amid growing interest in Japan among U.S. lawmakers, a phenomenon American officials attribute to rising security tensions in East Asia, as well as stirring of Japan’s economy after a long slump, triggered by Mr. Abe’s aggressive stimulus policy known as Abenomics. Mr. Rubio’s visit will be followed by a visit later this month by Rep. Ed Royce, a California Republican and chairman of the House Committee on Foreign Affairs. During last U.S. fiscal year ended Sep. 30, the number of the members of Congress who visited Japan more than doubled from the previous year to 28, according to the U.S. Embassy in Tokyo. Furthermore, two House lawmakers started the first-ever caucus on Japan earlier this month to press the White House to pursue Japan-related policies, such as the Trans-Pacific Partnership trade agreement. California Republican Devin Nunes and Texas Democrat Joaquin Castro are seeking other members to expand the bipartisan caucus. The caucus is a welcome move for Tokyo amid concerns over the dearth of U.S. lawmakers who advocate for Japan. Such worries have grown since the death of Sen. Daniel Inouye in 2012 and the retirement of Sen. Jim Webb last year — two lawmakers who had actively engaged in relations with Japan. Mr. Rubio is on an official visit to Asia this week, visiting South Korea and the Philippines, in addition to Japan. 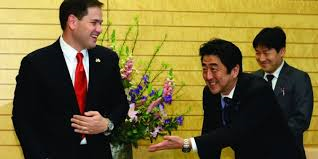 A little-known figure in Japan, Mr. Rubio was introduced by the local media as a young Republican leader who is among the party’s top candidates for the 2016 presidential race. During his two-day stay in Japan, Mr. Rubio received a briefing from Japanese coast guard officials on China’s increased maritime activities around disputed islands in the East China Sea, visited the U.S. naval base in Yokosuka and met with Japan’s defense and foreign affairs chiefs. Mr. Rubio received a briefing from Japanese coast guard officials on China’s increased maritime activities around disputed islands in the East China Sea, visited the U.S. naval base in Yokosuka and met with Japan’s defense and foreign affairs chiefs. 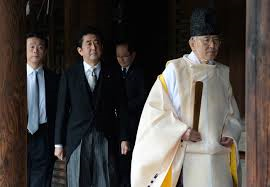 The Simon Wiesenthal Center, a leading Jewish human rights organization dedicated to learning the lessons from the Nazi Holocaust and WII criticized Japanese PM Abe's visit to the Yasukuni Shrine as "morally wrong". "As Prime Minister, he has the right to mourn for his nation's war—dead but not its war criminals. All people have the right to mourn the loss of their loved ones, including those who died in battle. 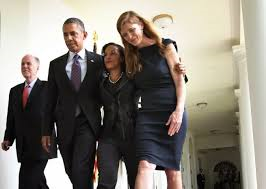 It is morally wrong however to co-mingle such reverence with those who were responsible for ordering and carrying out war crimes and crimes against humanity," said Rabbi Abraham Cooper, the associate dean of the Wiesenthal Center and a frequent visitor to Japan. "Further, this visit comes at a particularly sensitive time of increased threats to peace in the region from North Korea. The Prime Minister's visit to the shrine will hurt his efforts to strengthen US-Japan relations and his goal of to creating a stronger united front with Asian neighbors on issues related to security," Rabbi Cooper concluded. For more information, please contact the Center's Public Relations Department, 310-553-9036 , join the Center on Facebook, www.facebook.com/simonwiesenthalcenter, or follow @simonwiesenthal for news updates sent direct to your Twitter page or mobile device.